LAS VEGAS — Las Vegas, the entertainment capital of the world, will be the setting forYamaha Commercial Audio Systems Inc.’s open house to be held for members of the local professional audio community. The event will be Tuesday/Wednesday, July 10–11, 2007, at the Las Vegas Hilton Hotel, Crown Room. WESTLAKE VILLAGE, CA — Guitar Center, Inc. today announced that it has signed a definitive agreement to be acquired by affiliates of Bain Capital Partners, LLC, a global private investment firm. The total transaction value, including assumed debt, is approximately $2.1 billion. Audio-Technica U.S., Inc. introduced its SpectraPulse Ultra Wideband (UWB) wireless microphone system at InfoComm 07. Although you won't be using this any time soon, a live event version is being worked on; however, there’s no word on when it will be available. SpectraPulse is designed to deliver clear, intelligible audio without the performance and set-up issues associated with conventional wireless systems. 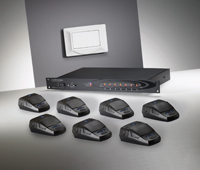 In addition, it is designed to provide high security levels and to be used in conferences or boardrooms, corporate events/meetings, courtrooms and other contractor/system integrator applications in the business, government and commercial markets. 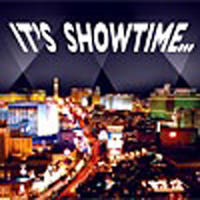 LAS VEGAS — Timeless Communications, publishers of PLSN and FOH magazines, has made their Event Production Directory, the most widely distributed production directory of its kind, available online at www.EPDweb.com. The Web version of the ultimate production guide contains all the information found in the print version, along with several enhancements made possible by the power of the Web. “It’s a quantum leap forward,” said Terry Lowe, publisher of the Directory. “The EPD has instantly become the industry’s preeminent search engine. All the information in the EPD is now online, and fully-searchable — not just by company, but by city, state or even a specific piece of gear. Petrol, a Vitec Group brand, introduces the Sound Knapsack. The Knapsack has three cushioned compartments designed for maximum storage and equipment protection. The main chamber comes complete with 8 removable pouches connected with hook and loop material for holding earphones, batteries, microphone, wireless systems, spare connectors, or tools in a special pouch. Windows of tough, transparent vinyl enable easy identification of contents. 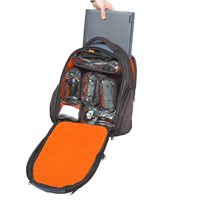 The knapsack’s padded rear section is large enough to contain a laptop computer with up to a 17.5-inch screen. A front organizer section is designed for stashing personal items such as keys, wallet, notebook, or pens, while keeping them close at hand. 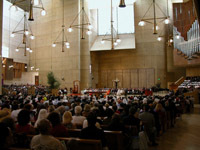 LOS ANGELES — The historic downtown Cathedral of Our Lady of the Angels has chosen AMT Systems Inc. and Shure to help it overcome the audio problems it faces due to its location within the steel and concrete canyons of downtown L.A. Bill Lightner, AMT V.P. of sales, chose Shure’s UHF-R wireless systems to meet the challenge. LOS ANGELES — Gwen Stefani’s “The Sweet Escape” world tour is underway, relying upon the performance of Midas consoles for her performances. 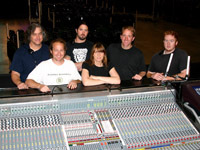 Stefani’s FOH Engineer Michelle Sabolchick and Monitor Engineer Jon Schimke are Midas XL4 fans who enjoy the hands-on responsiveness of an analog mix, along with the sound of Midas Preamps and EQs. The Heritage 3000 is handling sidecar duties at FOH. The PA is supplied and supervised by Sound Image. The latest product in the new Integrator Series is the Deuce 722, designed to solve numerous everyday audio processing problems for integrators. 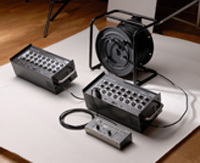 The Deuce 722’s toolset is designed to be applied to a variety of applications such as live sound speaker management, voice processing for public address, headphone processing and line sweetening for broadcast, nightclub system protection, and retail paging over background music or ambient noise compensation. 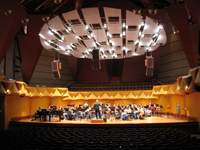 FULLERTON, CA — The 800-seat Meng Concert Hall at the new Performing Arts Center at California State University, Fullerton, features a sound reinforcement system designed by Multi-Media Consulting Inc. (MMC) of Los Angeles, incorporating EAW AX Series loudspeakers and SB Series subwoofers. MMC Founding Principal Rick Wells took the lead role in the system design process for Meng Concert Hall, specifying three sets of dual EAW AX366 loudspeakers to provide coverage throughout the room.